In the Caroline Islands this figure is called Nifi = Flint and Steel. Dr. Furness obtained it from a Uap boy named "Gumaun." 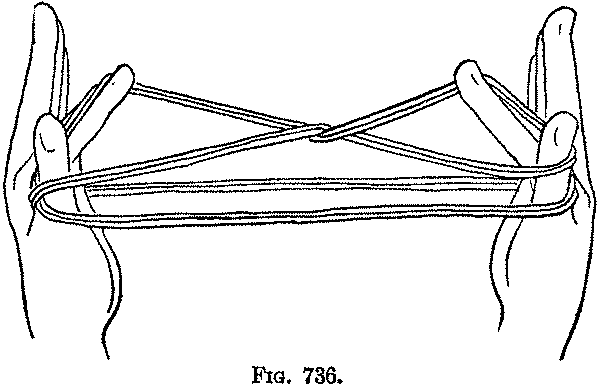 First: First Position, with the loop doubled and used throughout as a double string. 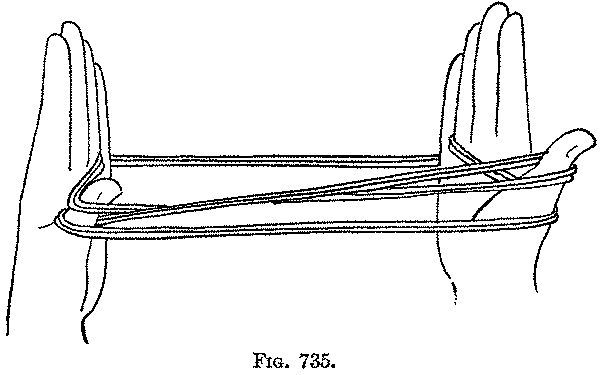 Second: Put the right thumb, from above, behind the strings on the left palm (Fig. 733), and separate the hands, turning the right thumb toward you, and upright (Fig. 734). 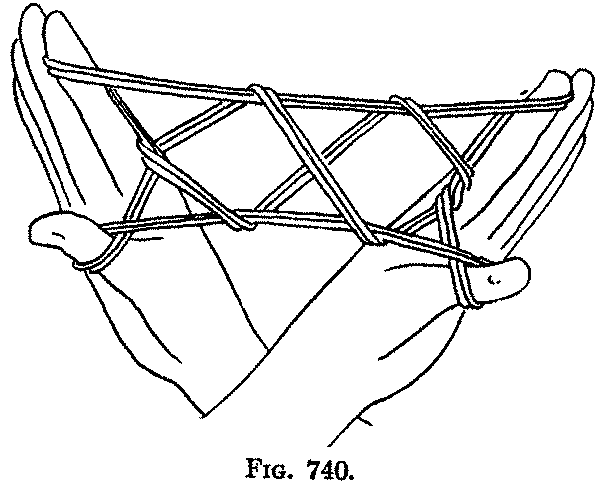 Third: Pass the left thumb away from you, and pick up from below on its back the near little finger strings, and return the thumb to its position (Fig. 735). 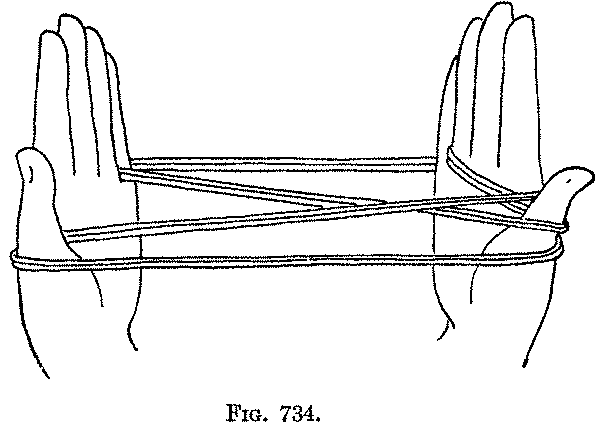 Fourth: Bend each index down, and pick up from below the far thumb strings (not the palmar strings), and hold them up on the back of the last joint of the index (Fig. 736). 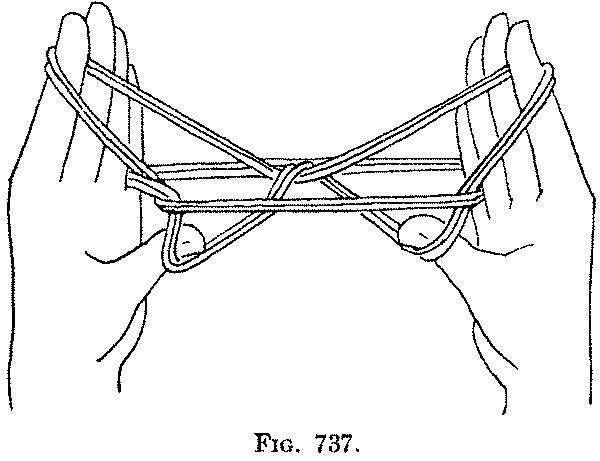 Fifth: Turn each thumb down toward the opposite thumb, and then toward you, under the straight strings passing from thumb to thumb, and back to its former position (Fig. 737). 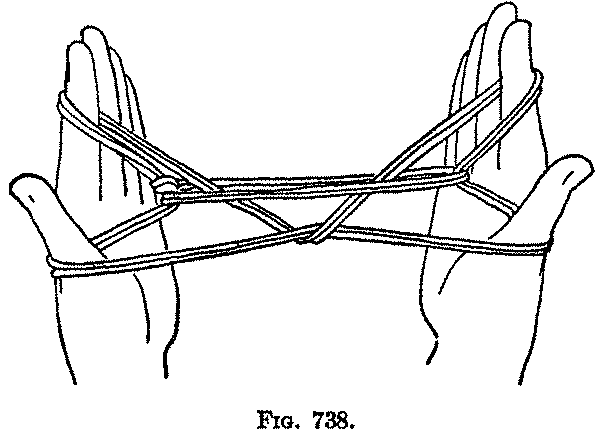 Release the loops from the little fingers, and draw the strings tight (Fig. 738). The hands are now in their usual positions; the thumbs, separated from the index fingers, are directed toward you. 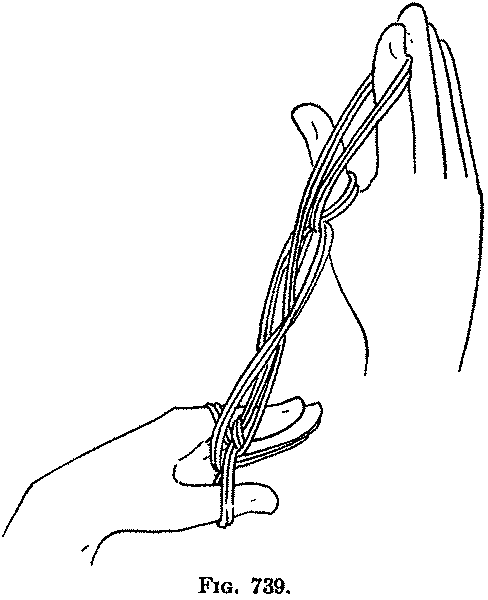 Sixth: Keeping the loops securely on the fingers, turn the right hand so that the right thumb passes under the figure; the palm is directed away from you, the fingers pointing upward; now turn the left hand with the palm away from you, and move it so that the finger tips sweep away from you, down (Fig. 739), and then under the figure toward you and upward. 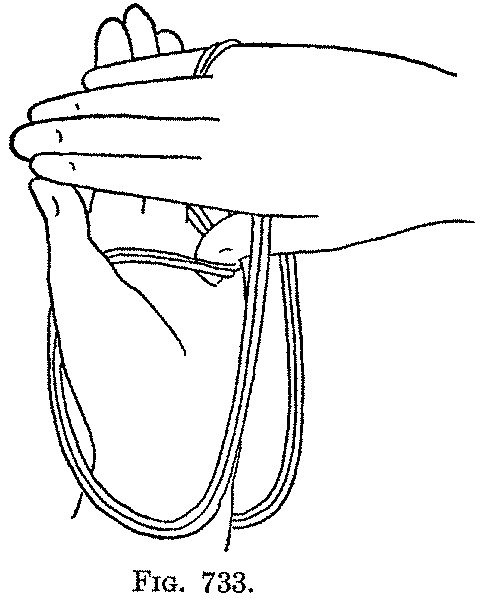 Carry the left hand to the right as far as possible, without moving the right hand, crossing the left wrist over the right wrist draw the strings tight with the hands having their backs directed toward each other (Fig. 740), the right palm directed to the left, the left palm directed to the right, and the thumbs pointing upward. This movement should be done quickly. The "fire" is supposed to lie between the thumb and index of the left hand. If a native were doing the figure, he would tell you to blow out the fire, and when you did so, bringing your head near his left hand, he would bring the thumb and index of each hand together quickly; the fire would surely be out, but your nose would be in—between his left thumb and index. In this figure we have a new opening and a new method of extension. The finished pattern closely resembles the pattern of the "Osage Two Diamondsi"; there are slight differences, however, in the crossing of the strings. In the fifth volume of the Reports of the Cambridge Anthropological Expedition to Torres Straits, page 17, Dr. Haddon gives a legend which is of interest in connection with this game. "Eguon, described as a large bat, is fabled to have introduced fire to Mawata. A legend goes that a tribe once inhabited Nalgi (Double Island), one of whose members showed fire to come from the left hand, between the thumb and forefinger, whereupon dissension arose and the people were all transformed into animals, birds, reptiles, fish (including dugong and turtle). Eguon found his way to Mawata, the others to different places in the Straits and New Guinea. There appears to have been some friendly arrangement among the snakes whereby some took to the land and others to the water. This legend was originally published by Mr. E. Beardmore, in his paper on 'The Natives of Mowat, Dandai, New Guinea' (Journal of the Anthropological Institute, xix, 1890, p. 462). I have quoted this as it is primarily a Torres Straits tale. The plucking of the first fire from between the thumb and forefinger is a widely spread myth in the Straits."